A coyote is seen in this undated file photo. 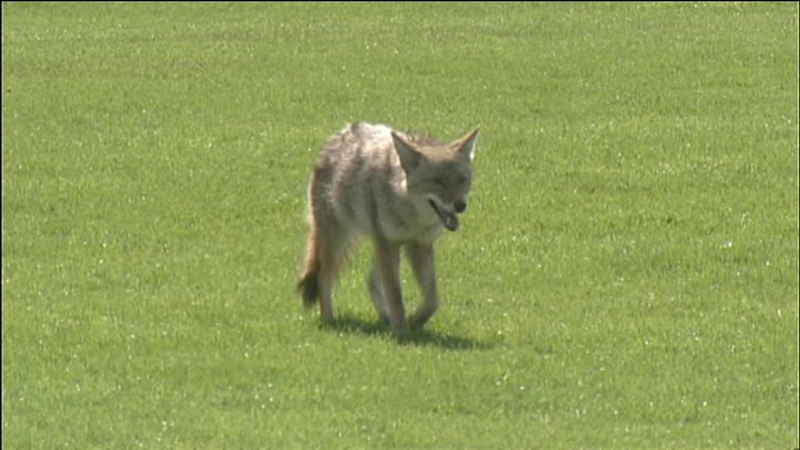 GENEVA, Ill. (WLS) -- Coyote concerns in the suburbs have some cities preparing to train residents in ways to scare off the animals. The move comes after coyotes have attacked and killed family pets in Geneva and St. Charles. Eyewitness News talked with one west suburban couple whose dog died after a coyote attack. Diane and Robert Sturkey saw a coyote attack their 8-year-old Yorkshire Terrier named "Otto" steps from their St. Charles home. "I carry a whistle with me now, I carry mace," said Diane Sturkey. "The coyote picked him up in his mouth and ran away. I'm running after the coyote and unfortunately that thing was a lot faster than me," said Robert Sturkey. In neighboring Geneva in the last half of 2014, there were 131 reported coyote sightings, four pets were attacked, and three of them were killed. It's prompted the city council to approve a training program for city workers and some residents. The plan consists mainly of reminding people to walk their pets on a leash and secure their garbage. If they see a coyote, they're supposed to yell or turn a hose on the animal. Elsewhere, some cities have allowed coyotes to be euthanized or fired at with paintball guns to scare them. "Never once did the city of Geneva consider allowing police officers or citizens to fire at these coyotes with paintballs or any projectiles," Geneva Mayor Kevin Burns said. The Sturkeys are skeptical. They spent $10,000 on a new fence to protect their two remaining dogs. "I've blown whistles, we've yelled, we've screamed and they still come back," Diane Sturkey said. Training people, they say, won't change an animal's instinct.